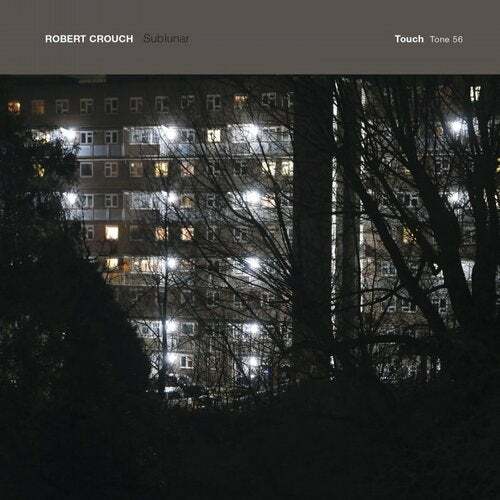 Robert Crouch is an artist and curator whose work encompasses sound, performance, and technology. As an artist, he locates his work with the intersection of post-phenomenological listening practices, conceptual sound art, and contemporary electronic music. At its core, his work can be understood as a conversation between tonality, context, history and subjectivities. Similarly, Crouch's curatorial work focuses on the overlapping disciplines of sound, technology, movement, and performance. Sublunar continues Crouch's inquiry into the complex relationships between sound, context, and meaning, first proposed in his 2016 release, A Gradual Accumulation of Ideas Becomes Truth (Line). The four tracks which comprise Sublunar were composed using field recordings from and audio files originally created for mas gestos y mas caras, a collaborative performance with artists Rafa Esparza and Yann Novak. mas gestos y mas caras was a durational performance incorporating sound, breathing, and a series of repetitive actions and gestures, choreographed within an architectural installation of adobe bricks fabricated and designed by Esparza. Sonically, Sublunar is a radical departure from the originating performance, yet these tracks remain tethered, literally and aesthetically, to the processes and context of their construction: Esparza's labored breathing, cautious footsteps, a soft cascade of water, dust, soil. The title itself, Sublunar, reinforces an attachment to the Earth and the physical world, and intentionally resists metaphysical interpretation or decontextualization.